An operating lease is an agreement to use and operate an asset without ownership. Common assetsTangible AssetsTangible assets are assets with a physical form and that hold value. Examples include property, plant, and equipment. Tangible assets are seen or felt and can be destroyed by fire, natural disaster, or an accident. Intangible assets, on the other hand, lack a physical form and consist of things such as intellectual propertyr that are leased include real estateReal EstateReal estate is real property that consists of land and improvements, which include buildings, fixtures, roads, structures, and utility systems. Property rights give a title of ownership to the land, improvements, and natural resources, such as minerals, plants, animals, water, etc., automobiles, aircraft, or heavy equipment. By renting and not owning, operating leases enable companies to keep from recording an asset on their balance sheets Three Financial StatementsThe three financial statements are the income statement, the balance sheet, and the statement of cash flows. These three core statements are intricately linked to each other and this guide will explain how they all fit together. By following the steps below you'll be able to connect the three statements on your own.by treating them as operating expensesFixed and Variable CostsFixed and variable costs are important in management accounting and financial analysis. Fixed costs do not change with increases/decreases in units of production volume, while variable costs are solely dependent on the volume of units of production. This guide teaches an analyst the fixed vs variable cost methods. 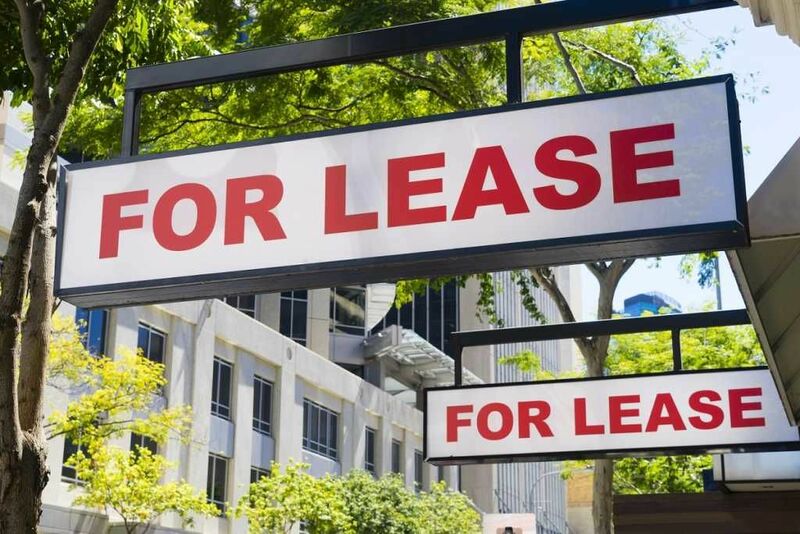 An operating lease is different from a capital lease and must be treated under different guidelines. Under an operating lease, the lessee enjoys no risk of ownership, but cannot claim tax benefits. Under a capital lease, the lessee is considered an owner and can claim depreciationDepreciation ExpenseDepreciation expense is used to reduce the value of plant, property, and equipment to match its use, and wear and tear over time. Depreciation expense is used to better match the expense of a long-term asset to the revenue it generates. and interest expenseInterest ExpenseInterest expense arises out of a company that finances through debt or capital leases. Interest is found in the income statement, but can also be calculated through the debt schedule. The schedule should outline all the major pieces of debt a company has on its balance sheet, and calculate interest by multiplying the for tax purposes. However, the leased asset and lease payments are shown on the balance sheetBalance SheetThe balance sheet is one of the three fundamental financial statements. These statements are key to both financial modeling and accounting. The balance sheet displays the company’s total assets, and how these assets are financed, through either debt or equity. Assets = Liabilities + Equity. If a lease does not pass any of the above criteria, it is considered an operating lease. Assets acquired under operating leases do not need to be reported on the balance sheet. Likewise, operating leases do not need to be reported as a liabilityLiabilityA liability is a financial obligation of a company that results in the company’s future sacrifices of economic benefits to other entities or businesses. A liability can be an alternative to equity as a source of a company’s financing. on the balance sheet, as they are not treated as debt. The firm does not record any depreciation for assets acquired under operating leases. However, if a lease does pass any of the above criteria, it is instead considered as a capital lease. A capital lease is treated differently from an operating lease. Instead of being treated as an operating expense, a capital lease is considered a financing expense. Therefore, we need to adjust the lease expense, depreciation expense, and interest expense numbers to account for this shift. This will have an effect on operating incomeOperating IncomeOperating Income, also referred to as operating profit or Earnings Before Interest & Taxes (EBIT), is the amount of revenue left after deducting operational direct and indirect costs. Interest expense, interest income, and other non-operational revenue sources are not considered in computing operating income, which will always increase when these expenses are recategorized. However, it will not have any net change in net incomeNet IncomeNet Income is a key line item, not only in the income statement, but in all three core financial statements. While it is arrived at through the income statement, the net profit is also used in both the balance sheet and the cash flow statement., as the change in numbers will balance out. There are two methods to capitalize leases: the full adjustment method and the approximation method. Find the operating lease expenses, operating income, reported debt, cost of debt, and reported interest expenses. Cost of debt can be found using the firm’s bond ratingCost of DebtThe cost of debt is the return that a company provides to its debtholders and creditors. Cost of debt is used in WACC calculations for valuation analysis. Learn the formula and methods to calculate cost of debt for a company based on yield to maturity, tax rates, credit ratings, interest rates, coupons, and. If there is no existing bond rating, a “synthetic” bond rating can be calculated using the firm’s interest coverage ratio. Using the interest coverage ratio, compare it to this table created by New York University, Stern Business School professor Aswath Damodaran. The remaining input data can be found in the company’s financial statementsThree Financial StatementsThe three financial statements are the income statement, the balance sheet, and the statement of cash flows. These three core statements are intricately linked to each other and this guide will explain how they all fit together. By following the steps below you'll be able to connect the three statements on your own. or the notes to the financial statements. By capitalizing an operating lease, a financial analyst is essentially treating the lease as debt. Both the lease and the asset acquired under the lease will appear on the balance sheet. The firm must adjust depreciation expenses to account for the asset and interest expenses to account for the debt. To do this, you must find the debt value of the operating leases. find the present value of future operating lease expenses by discounting each year’s expense by the cost of debtCost of DebtThe cost of debt is the return that a company provides to its debtholders and creditors. Cost of debt is used in WACC calculations for valuation analysis. Learn the formula and methods to calculate cost of debt for a company based on yield to maturity, tax rates, credit ratings, interest rates, coupons, and. The annuity method can be used if lease expenses are provided and remain constant over a timeframe of multiple years (e.g. years 6-10). We need to calculate depreciation and adjust interest expenses. To calculate depreciation, we use the debt value of leases and employ the straight-line method of depreciationStraight Line DepreciationStraight line depreciation is the most commonly used and easiest method for allocating depreciation of an asset. With the straight line method, the annual depreciation expense equals the cost of the asset minus the salvage value, divided by the useful life (# of years). This guide has examples, formulas, explanations. To adjust interest expenses, we begin with a simplifying assumption: operating lease expense is equal to the sum of imputed interest expense and depreciation. With this assumption, we can use our newly calculated depreciation value to find imputed interest expense on operating lease. Take the difference between the current year operating lease expense and our calculated depreciation value to find the imputed interest on the operating lease. Finally, add the imputed interest expense on operating lease to interest expenses to find adjusted interest. First, we need to adjust operating income. Begin with the reported operating income (EBIT)EBIT GuideEBIT stands for Earnings Before Interest and Taxes and is one of the last subtotals in the income statement before net income. EBIT is also sometimes referred to as operating income and is called this because it's found by deducting all operating expenses (production and non-production costs) from sales revenue.. Then, add the current year’s operating lease expense and subtract the depreciation on the leased asset to arrive at adjusted operating income. Finally, to adjust debt, take the reported value of debt (book value of debt) and add the debt value of the leases. Like the full adjustment method, we will need to collect the same input data. The second step for the approximation method is identical to the full adjustment method as well. We need to calculate the present value of operating lease commitments to arrive at the debt value of the lease. Unlike the full adjustment method, the approximation method begins with calculating imputed interest. This is simpler because there is no need to worry about depreciation methodsDepreciation MethodsThe most common types of depreciation methods include straight-line, double declining balance, units of production, and sum of years digits. There are various formulas for calculating depreciation of an asset and guidelines. To calculate the imputed interest on the operating lease, use multiply the debt value of the lease by the cost of debt. We can use this imputed interest value to adjust the interest expense. We do this by adding the imputed interest to interest expense. 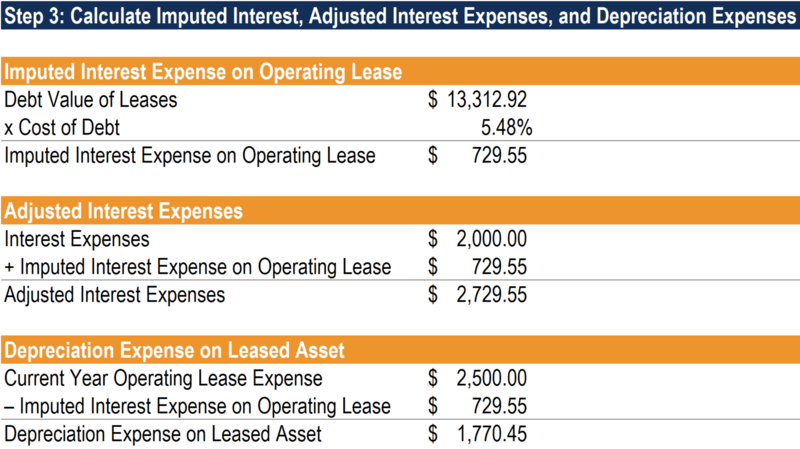 Finally using our simplifying assumption from earlier, take the difference between the current year’s operating lease expense and the imputed interest to find depreciation expenses. Adjusting financials with the approximation method is slightly different from the full adjustment method. Begin by adjusting operating income. Take the reported operating income (EBIT) for the year and add the calculated imputed interest on operating lease to obtain the adjusted operating income. Finally, adjusting debt is the same as the full adjustment method. Add the debt value of the leases to the reported debt value. FCFF will increase because the imputed interest expense on the capitalized operating leases is added back to the operating income (EBIT). FCFF will decrease if the present value of operating leases increases (and vice versa) due to the net change in capital expendituresCapital ExpendituresCapital expenditures refer to funds that are used by a company for the purchase, improvement, or maintenance of long-term assets to improve the efficiency. This occurs because we must treat operating leases like capital expenditures if capitalize them. Furthermore, the weighted average cost of capital (WACC)WACCWACC is a firm’s Weighted Average Cost of Capital and represents its blended cost of capital including equity and debt. The WACC formula is = (E/V x Re) + ((D/V x Rd) x (1-T)). This guide will provide an overview of what it is, why its used, how to calculate it, and also provides a downloadable WACC calculator will decrease as the debt ratio increases, which has a positive impact on the value of the firm. It is important to note that the increase in firm value derives solely from the value of debt, and not the value of equity. If the debt ratio stays stable, and the operating leases are fairly valued, treating operating leases as debt should have a neutral effect on the value of equity. We hope you’ve enjoyed reading our guide to operating leases. To learn more, see the following free resources.